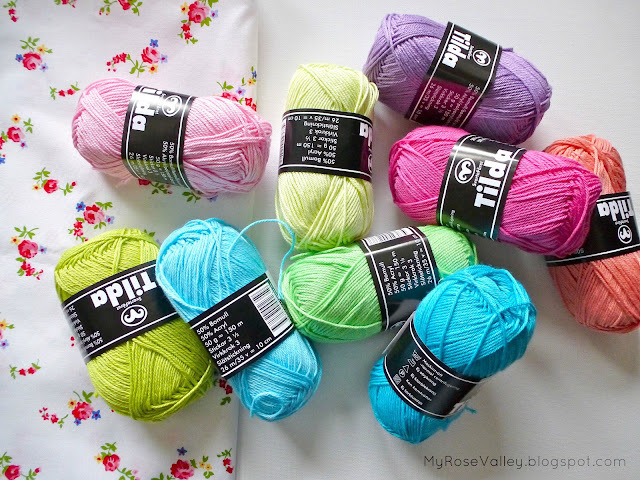 My Rose Valley: Yarn therapy! I'm anxious to try it. Just picture a Granny square. Melody "Food glorious food" from Ice Age. Yarn calms me too, just touching it makes me happy. Love your colors. Oh my gosh, I'm sitting here with coffee singing your song and laughing. Thanks for the fun post. Yarn and fabric, they both make me feel the same way as you wrote. I love the colors of yarn in your photo. Beautiful. Wonderful colors, I love them! Oh yeah! I totally agree with you, yarn holy yarn!! Love that song, originally from "Oliver"? I will be singing it all day too. Love the words you put to it. I am so excited for my yarn order. Thank you for bringing these beautiful colors to us. Beautiful, luscious colours of yarn!! Beautiful Colors...I started crocheting something in my mind as soon as I saw them. Thank you for the lovely inspiration! Your yarn colors are absolutely glorious - so the song is a great fit here. Thanks for giving us a laugh this morning! the colours of that yarn are fabulous! Gorgeous colours, Annette! I can understand why you are singing!